Market-driven and mission-centered, One Lake Merritt leverages a host of community partners, institutional service providers and philanthropic investments to provide the most benefits to the most Oakland residents, while creating long-term sustainability for an historic asset in the Oakland Auditorium. One Lake Merritt will generate an impressive amount of tax revenue for the City of Oakland, vital city institutions and the surrounding neighborhood- over $5 million in annual tax revenue and $200 million in economic activity! We also expect thousands of jobs created, including hundreds of paid internships and other contextualized learning opportunities through Peralta Community College District and the Oakland Unified School District. In essence, One Lake Merritt becomes a permanent endowment for a robust community benefits district, including support for the new improvements to Lake Merritt. 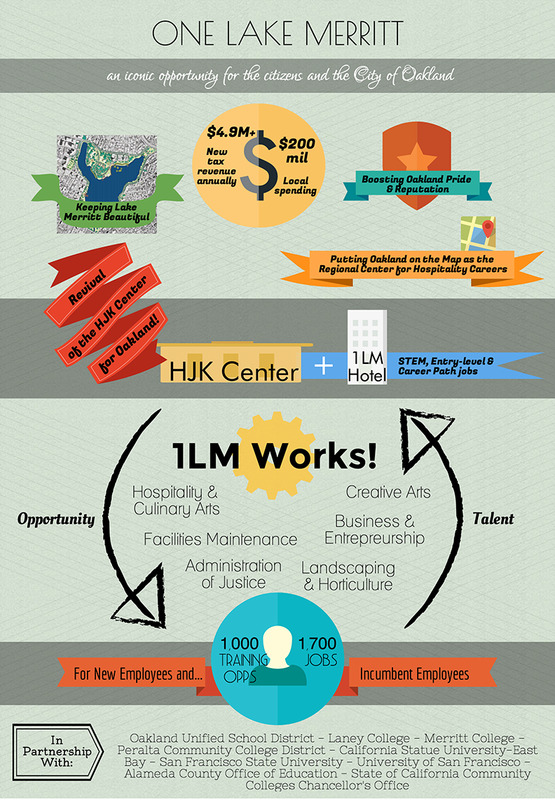 The centerpiece of our community benefits strategy is 1LM Works- a comprehensive workforce development, training and employment program that utilizes an educational continuum from OUSD, to Peralta and local 4-year institutions, to a life-sustaining and highly upwardly mobile career. One Lake Merritt will source a majority of the labor for ongoing operations from the 1LM Works! 6 primary career pathway programs. Whether you come for the diversity, the food, or the natural beauty, Oakland's arts community is unparalleled and One Lake Merritt will be the cultural epicenter for all forms of art, from local ethnic offerings, to large headline acts and stunning visual exhibitions. We will work closely with local arts organizations to highlight the fact that Oakland possesses the most richly diverse arts community anywhere! Through resident organizations, community access programs and rotating exhibits, the new Oakland Auditorium Arena, Theater and 1LM Hotel will exist for all! One Lake Merritt will create a cutting-edge opportunity for visitors and residents to experience sustainability in Oakland. Guests will be entranced by the wall of gorgeous greenery filtering fresh air within the 1LM Hotel and families will enjoy fresh, local food as they dance and play in the new lakefront plaza. From green construction materials to onsite transportation opportunities and efficient heating and cooling systems, 1LM will exude a vibrant, diverse, thoughtful, and grounded ethos throughout. In pursuit of Net Zero energy consumption and LEED platinum certification, CDP is considering several regenerative concepts for the development including a heating and cooling plant for the entire facility. We are also pursuing system wide water recycling, balancing gray and potable water as appropriate. Our goal with One Lake Merritt is to provide the highest level of benefits to the participants in our programs and to do this we will work with a range of city, county and nonprofit agencies to make sure we are supporting the whole person through a health-wealth approach, not only supporting local residents with training and employment, but also helping to ensure they have access to services on-site and throughout the county which ensure that they are healthy, happy and productive.